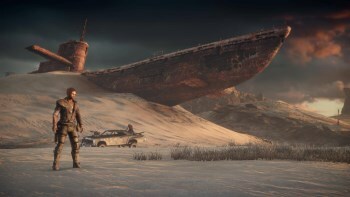 Mad Max Game World Will Maintain Movie's "Sense Of Mystery"
Avalanche Games wants to maintain a "sense of mystery" about the Mad Max game world and let players draw their own conclusions about how it came to be. I've always found it interesting that Mad Max - the original - was set in a not-quite-post-apocalyptic world: Things were bad and you couldn't avoid the feeling that civilization was teetering on the brink of something, but it hadn't quite toppled over yet and the worst evidence of its decline remained on the fringes, "out there, with the garbage," as you might say. Things had gone completely over the edge by the time Mad Max 2, aka The Road Warrior, came around, but there was never any explanation as to what had happened, or why - only that "for reasons long forgotten, two mighty warrior tribes went to war and touched off a blaze which engulfed them all." That's fine for a movie but not really sufficient for an open-world game, where some knowledge of history is an important part of the experience. So Avalanche intends to find a balance between the two, working out a more detailed background for internal use but not spoonfeeding it to players. "We want to maintain that sense of mystery about what has happened in the world, and what is the history of every place that we visit. And while some of it is things that we have explained in development -- either on our own or through the consulting with George Miller -- while we know it, we don't spell it out to people, but it affects how certain areas are constructed and what we find in certain areas," Senior Game Designer Emil Kraftling told AusGamers. "There's a lot there for the players to discover if nothing else. They won't get the answer, but they will be able to look at a place and start thinking about how it came to be like that." "There's a lot of interesting stuff there for us as developers as well as for players, and what we know and what the players know will not necessarily be the same," he said. "In some instances, I know myself that we have some stuff in the world, and it's not described anywhere why it is how it is, but I'm making educated guesses as to why it is this way; what used to be here? And what would people in this world think that this was? So that sort of sense of mystery, that's something that we really wanted to hang on to." One thing the studio is being very specific about, on the other hand, are the cars. Kraftling said the "physics-based vehicle gameplay" means that what kind of car you have, how much it weighs, what you've packed into it and even how heavy you are on the throttle will all affect fuel consumption. "That's something that will be more important here, compared to a game like GTA, where it's very much just 'get in and drive away' type of cars. Even other games that have done it, like the Mafia games, it never really came into play, it was more of a thing for the sake of having it," he explained. "Whereas we're really determined to have it have a real gameplay impact, and have you feel like this is something really valuable, without taking away your urge to actually drive and use cars and engage with vehicles." Mad Max is slated to give it the bejeezus in 2014 for the Xbox 360, Xbox One, PlayStation 3, PlayStation 4 and PC.